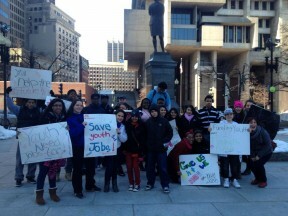 February 21st marked the latest action by the Youth Jobs Coalition. Comprised of 28 youth and community organizations in Massachusetts and co-founded by JOIN for Justice alumnus Dan Gelbtuch, the YJC has been at the forefront of the fight to protect state funding for youth jobs programs from budget cuts since 2009. This year, JOIN alumni Dan (c/o 2008), Chris Messinger (c/o 2009) of Boston Mobilization , Dylan Lazerow (c/o 2012) of Teen Empowerment , and Ilana Lerman (c/o 2010) of the Greater Boston JCRC were all instrumental in bringing over 1,000 teens from over a dozen cities and towns across Massachusetts to the Statehouse to voice their support for youth jobs. The participants were addressed by Boston’s Mayor Thomas Menino, a national leader around youth employment as well as by faith leaders from the Jewish Community Relations Council, the Episcopal Diocese of Massachusetts and the Black Ministerial Alliance. To learn more about how our alumni are organizing the next generation of community leaders to protect resources for young people today, check out the whole story at boston.cbslocal.com. This entry was posted in Alumni At Large, Our News and tagged Alumni, Boston, Jobs, youth. Bookmark the permalink.